This great bag is for sale now on Etsy. Such a pretty bag...This would make a great diaper bag or large handbag for the Shabby Chic lover out there. As you know, I adore Shabby Chic style and this bag has been on my favorites list from the moment I saw it. I spotted this handbag named the Ava Roses bag over at A Touch of Stardust on Etsy. 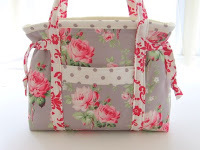 If you adore Shabby Chic handbags, PLEASE buy it so I don't go through checkout with it! Even though my August no buy applies to bath, body, fragrances, etc...I still do not need another bag!